Bruce Thibodeau poses Sept. 27 with the duck boat he retrieved from the Sawtelle Deadwater, after he capsized there two days earlier. The hunter stood in waist-deep water for 12 hours until a game warden found him. That’s when he knew his gamble had paid off. 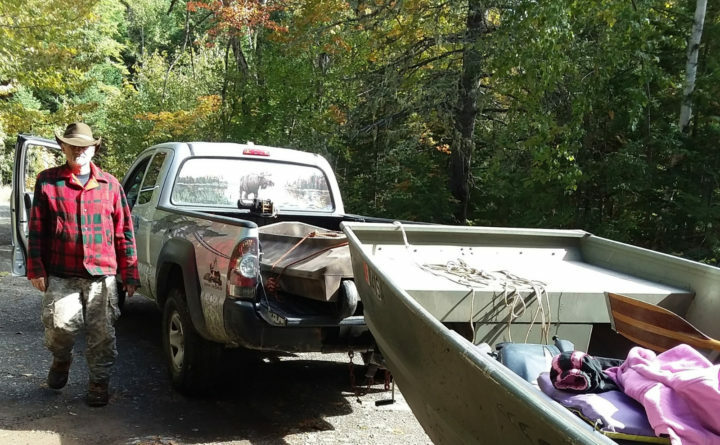 After his boat had flipped earlier that afternoon, stranding him alone in the swampy Sawtelle Deadwater in northern Penobscot County, the 57-year-old outdoorsman decided to stay put instead of swim to shore, believing he’d freeze to death if he attempted to paddle through the thick vegetation and muck. “I’m thinking, Jeez, what should I do?” Thibodeau of Silver Ridge said in an interview two days after he was rescued in the early morning hours of Sept. 26. “Well, my best bet’s to stay just where I’m at,” he thought. Earlier that morning, he had left a note for his wife on the kitchen counter, explaining that he decided to forego field hunting for ducks and would instead head for the Sawtelle Deadwater, a marshy lake between Herseytown and the unorganized territory of T7-R7. Thibodeau is a certified Maine guide, Baxter State Park ranger, and has hunted, fished and trapped all his life, he said. Hunter Bruce Thibodeau fishes his submerged duckboat out of the Sawtelle Deadwater on Sept. 27. Two days before, it flipped over while he was duck hunting, stranding him in the swamp water for 12 hours. 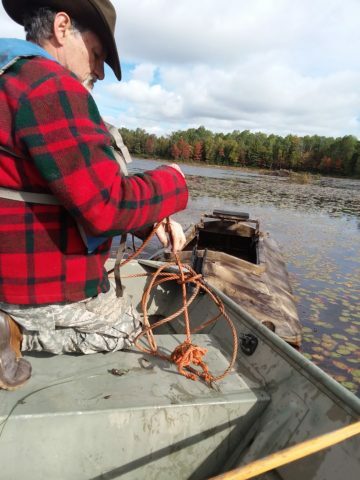 After parking his truck along the shore of the deadwater, he motored about a mile into the swamp aboard his brand-new Beavertail Final Attack duck boat — a small hunting vessel, only about 8 feet long and 4 feet wide. He killed the engine and retrieved his shotgun. At around 2 p.m., he hadn’t shot any birds, and he turned to leave. Leaning over to turn on the engine, his weight rocked the vessel and it suddenly flipped — briefly trapping him underneath. He kicked himself free, and quickly realized there was no righting the overturned boat, which remained bobbing near the surface, kept slightly afloat by the foam affixed to the inside of the hull. He didn’t think he could make it to shore without succumbing to the freezing cold water. The distance was too far and the water was swampy — full of deep muck and dense with vegetation, he said. His best bet was to stay warm and wait, he decided. He also thought, “Don’t panic.” He pushed the boat to shallow water, stuck a paddle in the mud to stabilize himself, and climbed on the submerged hull. The water came up to his waist. He managed to keep himself warm with a neoprene life jacket and a warm hat, knowing that heat leaves the body quickly through the upper body and head. He never hunts wearing waders, so there wasn’t much he could do to keep his legs warm except to shift his weight, he said. He stood there waiting for the next 11 hours, moving only to keep his back against the wind and the rainy drizzle, and to lean against the paddle. It had been dark for hours when he finally heard the sirens. With his shotgun somewhere underwater, the hunter reached for the only thing he had to signal his whereabouts: his goose call. He honked three times, and the siren answered. This repeated a few more times until Thibodeau saw a game warden appear on the distant shoreline. It took another hour for wardens to come for him in their boat. At that time, Thibodeau learned that his wife, Joan, hadn’t seen his countertop note, but when he didn’t come home on Tuesday night, she called the authorities and gave them every guess as to where he might be. On Thursday, after a good night’s sleep but with extremely sore legs, Thibodeau went back to retrieve his gear and capsized boat. He made sure to bring his bigger boat. “I’m done with small boats,” he said.